Corn grits are a staple across western Georgia, where you’re likely to find them piled on a plate with slices of smoked sulguni cheese sticking up from their depths like sharks’ fins. In Georgian, plains grits are called ghomi, while grits with cheese mixed in are elarji. I love serving them with Spiced Meatballs and Pomegranate Gravy, shishkebabs of any sort, or garlicky roasted chicken. In a medium saucepan, bring water, milk, and salt to a boil. Add the corn grits in a steady stream, whisking continuously to prevent lumps from forming. Reduce the heat to low and continue to cook, whisking frequently, for 10-15 minutes, until all the liquid is absorbed and the grits are thick and soft. Remove from heat. Stir in the butter and grated cheese until melted. Serve hot. Grits can be made in advance and reheated. Store them in the fridge for up to one week and in the freezer for up to 6 months. When I was growing up, the only time meatballs ever showed up on the table was at Christmas, when one of my aunts would make several pans worth of Swedish meatballs in their creamy, slightly sweet gravy. I got it into my head that making meatballs must be labor-intensive, because why else would these little balls of heaven that everyone loves only be made once a year? I never really questioned this assumption until I watched a Russian acquaintance in Moscow make meatballs for her family’s weeknight dinner. She threw together the ground meats and an egg, tossed in some salt and a couple of spices, rolled out the balls while we chatted, and fried them up. The whole process took maybe 40 minutes, including the time it took her to grind the meat herself in a grinder she clamped on to her counter. 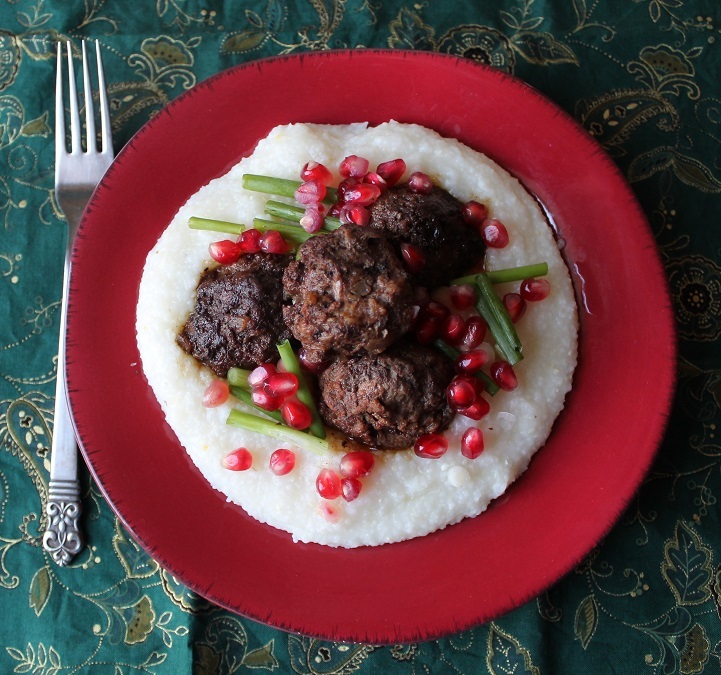 Years later in Georgia, I discovered abkhazura, meatballs from the mountainous region of Abkhazia spiced with tart barberries, red chili pepper, ground coriander, and other herbs. I created this recipe with those zingy flavors in mind, adding panko breadcrumbs for extra tenderness and a pomegranate gravy as a culturally appropriate nod to the saucy meatballs I loved as a child. I love to ladle these meatballs over cheesy grits, a common side dish in western Georgia, but they go just as well over rice or noodles. They’re easy to take to work and reheat in the microwave, too. Serve them with garlicky roasted kale or a peppery arugula salad. Roll small handfuls of the mixture into golf-ball-sized meatballs, about 1 ½ in. in diameter. Heat the butter or oil in a large, heavy-bottomed skillet over medium heat. (I use a cast iron pan. Nonstick pans are not ideal because they prevent the meat from browning properly.) Add the meatballs in batches, turning to brown all sides, about 6-8 minutes. (The key here is not to crowd the meatballs: if they’re too crowded, the meat will steam rather than sear.) Transfer the meatballs to a plate lined with paper towels. Make the sauce: Melt the remaining 2 tablespoons of butter or oil in the same pan. Sprinkle in a tablespoon of flour and let it cook for one minute, stirring often. Add ¼ cup of the pomegranate juice. Scrape the browned meat bits off the bottom of the pan with a spatula and mix them into the juice. Gradually add the rest of the juice, whisking to make sure no flour lumps remain. Finish cooking: Reduce the heat to low and add the meatballs back into the gravy. Cover and cook another 12-15 minutes, turning the meatballs once at the halfway point, until they are cooked through. Serve: Serve the meatballs hot over Smoked Cheese Grits, noodles, or rice. Garnish with thin sliced red onion, scallions, fresh cilantro, and/or pomegranate seeds if you like. Make ahead: Meatballs can be made in advance and reheated. Store them in the fridge for up to one week and in the freezer for up to 6 months. Like Samegrelo, Svaneti is a region named for its inhabitants, the Svan people. They also speak their own language, one full of intimidating consonants that spring from the back of the throat. As we hurtled upward, I marveled at how these highland people and the Georgians below them had ever mixed centuries before this road was laid. I can only imagine the courage and fortitude those emissaries, traders, explorers, and others must have had to make that journey into or out of this silent, truly awesome landscape, not knowing what they’d find on the other side. Among Georgians, the Svans still have a reputation for being stoic, suspicious of strangers, and better suited to self-defense than the hospitality Georgians so pride themselves on. 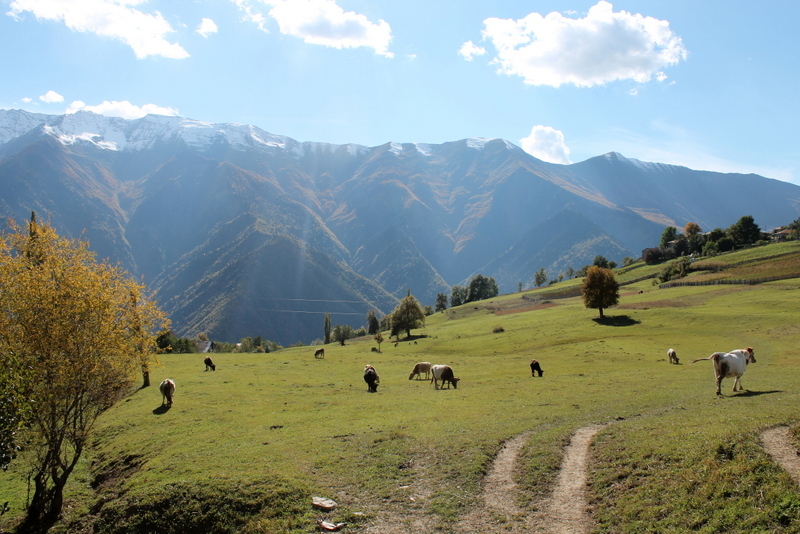 My destination was the village of Etseri, a jumble of homes and small farms at the 112 km marker off the main road from Zugdidi to Mestia, Svaneti’s regional capital. A Canadian man I’d met while teaching English in Batumi a few years ago and his Georgian wife have since opened a guesthouse there, the first one. Everywhere you look is a postcard view—hell, an expansive, mighty National Geographic view. 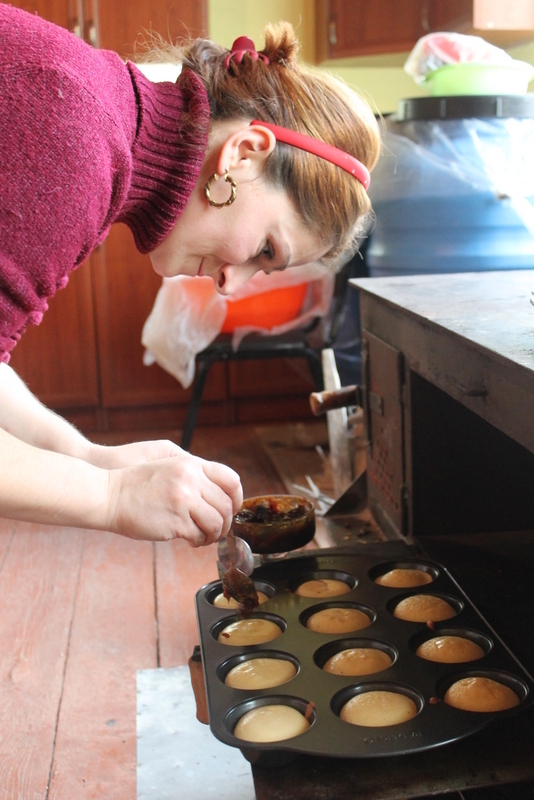 There are no shops and no restaurants in Etseri, so Tony and Lali (and sometimes their hired kitchen help, a neighbor woman called Nana) prepare all the meals their guests eat from scratch. What there are plenty of up here is cows. They roam freely across the hillsides—and in the road, down the path, next to the school, etc.—munching grass and getting muddy and placidly outnumbering people. Tony and Lali keep one of their own for milk. I went out with Lali one evening to milk their cow (unnamed, as she will become dinner(s) one day). I was surprised by how hard I had to pull on her udder to coax the warm milk out of it, not wanting to cause the cow any pain. “Once you see how hard the calf pulls on them, you stop worrying so much,” Tony reminded me. 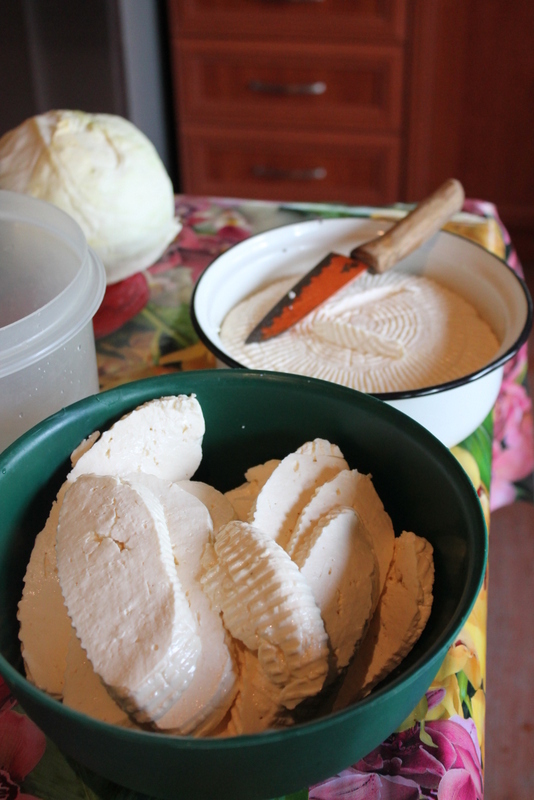 The most common cheese in Georgia is called imeruli qveli (Imeretian cheese, for the central Georgian region of Imereti, though it’s ubiquitous everywhere). It’s a fresh, salted cow’s milk cheese that crumbles easily when cool and melts smoothly when hot. To make it, you heat the milk, add a few drops of rennet, let it sit until curds form, stir again, then dip your hands into the liquid and slowly begin to gather the curds into a mass at the side of the pot, letting the whey slide through your fingers. (This feels wonderful on a cold autumn night, where the only heat in the house emanates from the wood stove you’re standing over.) Once the curds have come together into a solid shape, lift it from the pot and set it in a colander over a bowl to drain overnight. In the morning, you have a basket-shaped block of cheese. Salt it on both sides: this helps to preserve it. If you want to make the creamier, more pliable sulguni (think Georgian mozzarella), just cut the imeruli cheese into slices, melt them in warm water or fresh milk, and slowly gather the cheese back into a ball, squeezing out any excess whey as you go. My cooking lesson with Nana the Svan began the next morning. She looks not much older than me but already has three children, and plenty of experience cooking for a crowd. 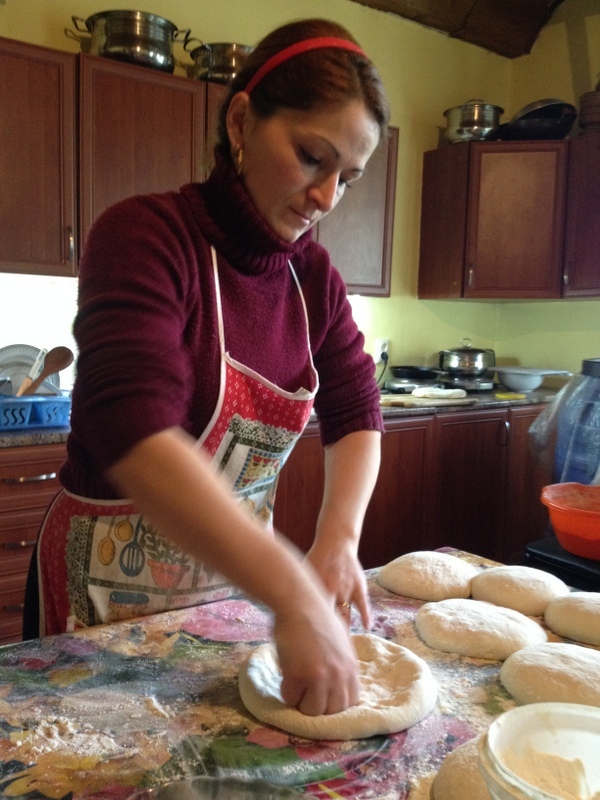 She starts off with a chicken, potato, and tomato stew and a salad of shredded cabbage, carrots, and onions, then mixes the dough for khachapuri and kubdari, a savory pie stuffed with chopped meat and onions that is a specialty of Svaneti. We pause for lunch with Tony and Lali and the workers who are renovating the upper floor of their guesthouse, washing down the soup and salad with machari, or immature wine. 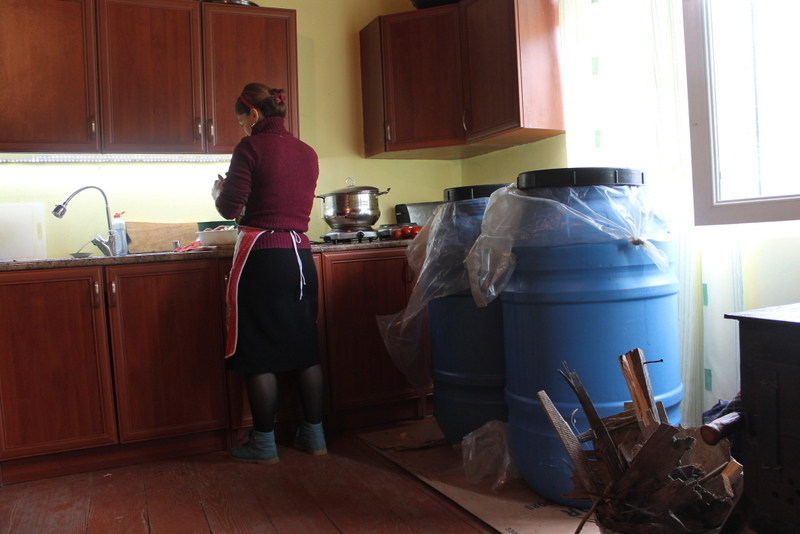 Like most Georgian village families, Tony and Lali make their own wine at home in the fall. 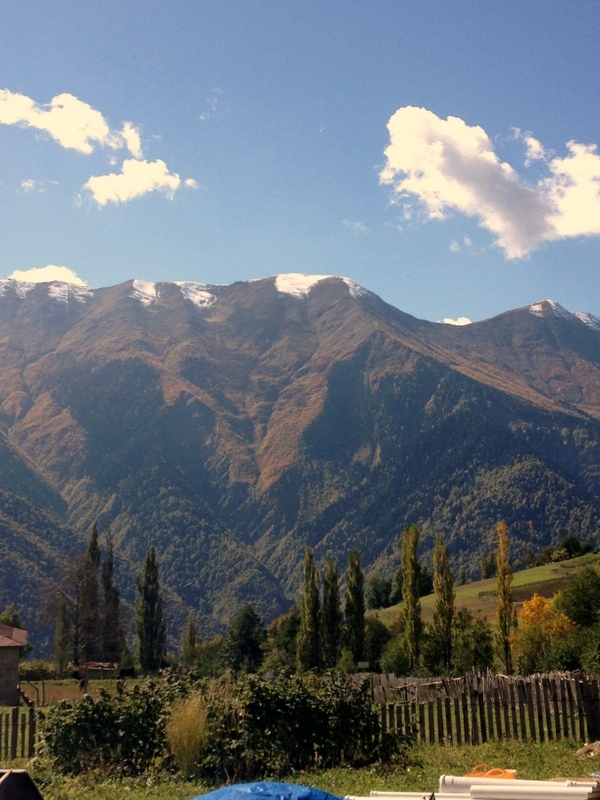 The climate in Svaneti doesn’t lend itself to grapes, so they order theirs from Kakheti, Georgia’s wine region in the east. The white rkatsiteli grapes ferment for a few weeks in big plastic barrels, fizzing and bubbling while their natural sugar turns into alcohol. The barrels are covered lightly during this period to keep bugs and dust out, but not sealed completely, as the gases released during fermentation need somewhere to escape. You can drink this sweet-tart liquid (machari) until the barrels are sealed and the wine is left to age until springtime. You can see these barrels all over Georgia in the fall, when families make their own wine at home. After lunch Nana throws together some cupcakes filled with spoonfuls of jam or coffee cream and topped meringue and chocolate icing. As they’re baking, she finely chops chunks of beef and pork and mixes them with minced onions, garlic, oil, spices, and herbed Svan salt to make the filling for her kubdari. For the khachapuri, she crumbles a bunch of salted cheese into a bowl and adds chopped beet greens to half of it, then rolls tennis ball-sized chunks of filling for each of the pies. Getting the filling inside the dough isn’t hard, but making sure the filling reaches the edges of the pie inside can be challenging. Nana has the technique down to a science, and I don’t think she’d quite realized that until she tried to teach me how to do it. Basically, she gently stretches a hummock of dough into a round slightly larger than the filling ball, pulls the edges of the dough up around the filling and twists them together at the top to seal it shut, flattens it with her palm, and then spreads the pie out by pressing down in concentric circles starting from the center. My attempts to copy her movements first mad her shake her head and then giggle, but after several more tries she seemed decently satisfied with my progress. After stuffing, each pie sat for a few minutes on top of the wood-burning stove to proof, then baked for about 10-15 minutes inside. Nana poked a small hole in the top of each kubdari before baking to let steam escape. As each pie came out, she brushed the top of it with melted better. The aroma of woodsmoke and roasted garlic filling the kitchen was making me salivate. It wasn’t time for dinner yet but I couldn’t resist: I cut one kubdari pie like a pizza and dug in. No surprises here: just hot, chewy dough, juicy meat, pungent garlic, and satisfying salt. Perfect mountain food. Or for that matter, perfect pizza alternative anywhere in the world. Stay tuned for a recipe! 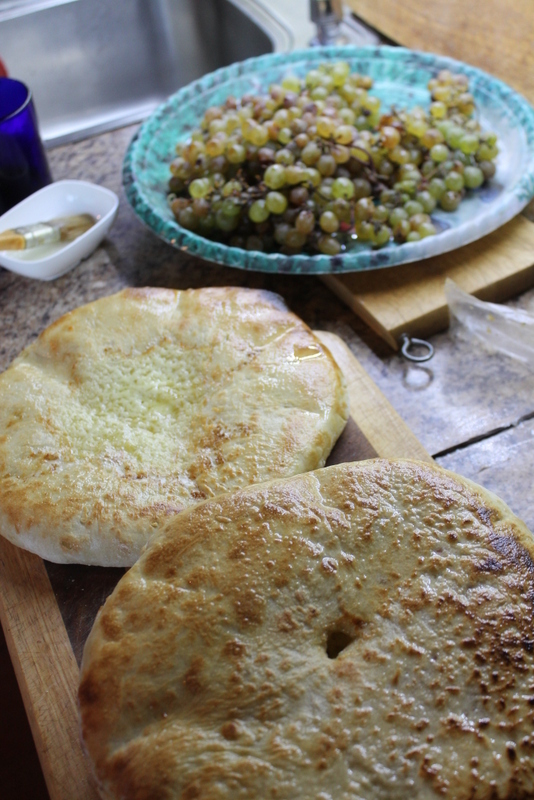 Kubdari and khachapuri cool on the counter. Hungry yet? Have you ever tried kubdari? Where, and what was it like? Tell us in the comments. Want to stay at the Hanmer Guesthouse yourself? Find them here on Facebook. 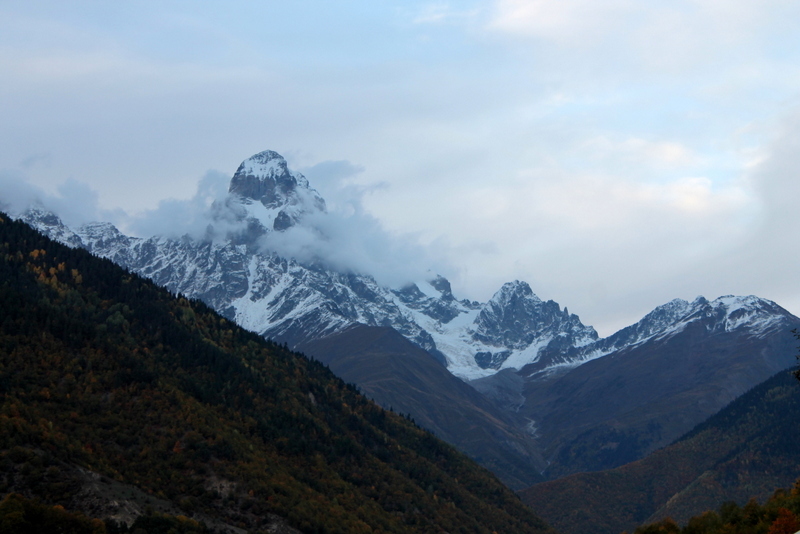 More photos from my stay in Svaneti are available on the Georgian Table Facebook page.